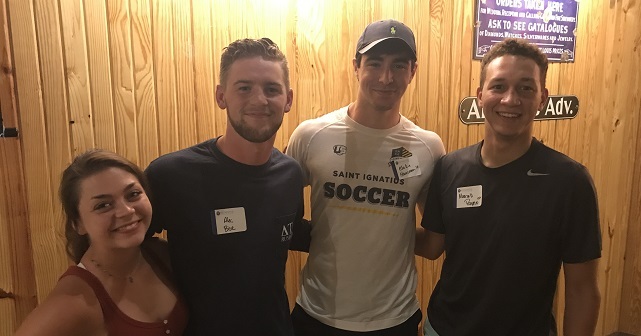 Westminster staff, alumni, and students came together at Shakespeare’s Pizza in Columbia, Missouri, on Tuesday evening for the annual Mid-Missouri Senior Send-Off. The event celebrates recently graduated high school seniors in the area who plan to attend Westminster in the fall. The newest members of Blue Jay Nation enjoyed a night of pizza and conversation as they got to know the Westminster family. This year’s Senior Send-Off was hosted by Beth Stubbs ’00 (Kappa Kappa Gamma) and Dan ’04 (Delta Tau Delta) and Kristen ’06 Jackson.